Viana was only with us for a very short time, but in that time,she made a big impact on everyone she met. We often take in rabbits, like Viana, who are very wounded, sick or traumatized. 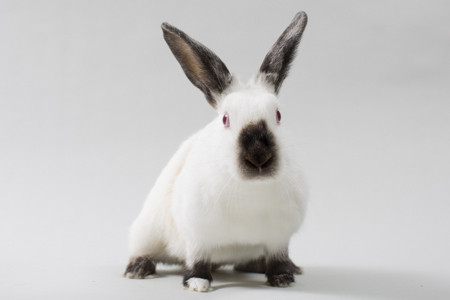 These rabbits often become "old soul" messengers and teachers for us and even the veterinarians with whom they interact. Viana came to us with a gaping wound on her side, likely from a dog bite. She had been abandoned at a veterinarian's office and then taken to Sonoma County Animal Control which called SaveABunny for rescue assistance. From the moment Viana popped her little head out of the carrier we knew she was special. She had such a sweet disposition with just enough fire to make her fun. She sought out attention and would place her paws on your chest and snuggle down deep. Sadly, it soon became clear that something was very wrong with Viana. She lost a lot of weight and became listless. We took her into the vet right away and x-rays showed areas of major concern in her chest cavity, abdomen and diaphragm. We took her to UC Davis for emergency surgery and they discovered abscesses filling her chest area and pressing on the organs. The abscesses---likely a result of the dog bite wounds, filled at least 30% or her tiny body. The condition was painful and inoperable, so euthanasia was strongly recommended. With tears and a heavy heart we decided to let her go and not wake her up from the surgery. As many of you know, I do a lot of energy healing work with and for the bunnies (and people). This is probably why we are so successful at the intense rescue and rehabilitation work with severely wounded, neglected and traumatized rabbits. Viana had an amazingly pure, loving "spirit" about her. Here's is what I learned from Viana during a shamanic journey to accompany her passing: What happened next is hard to describe and perhaps you do not believe in the reality of energy work. So I will try to just give you the essence of what I experienced. When our/ your beloved rabbit companion dies, their bright, positive energy becomes a part of your own energy field. It builds and grows as you go through life living with your bunnies and letting them go. It's like wearing a big band of light around you as you walk through life. Imagine the rings of Saturn, but all white. It doesn't matter if the rabbit was only with us/ you for a very short time When the experience you share with them was one of love and kindness ( regardless of how much trauma or abuse they suffered at the hands of someone else before they met you), they are grateful and return the love back to you in a magnified way that is forever with you. Viana was only here for a short time, but opened our hearts and minds to the richness of what life and love is truly all about.